Mr. Christos Megalou is Chief Executive Officer (CEO) and Executive Board Member of the Board of Directors of Piraeus Bank SA. 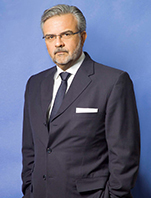 From 2013 to 2015 he was Chief Executive Officer (CEO) of Eurobank Ergasias SA. On 2015 and 2016 he acted as a Senior Advisor of Fairfax Financial Holdings in Toronto and London and from May 2016 was engaged as Senior Advisor of Advent International in London. ?r. Megalou held senior positions at Credit Suisse Investment Banking for over 16 years in London, UK. He was elected, for two consecutive runs, Chairman of the Hellenic Bankers Association in the UK (2010-2013), Deputy Chairman of the Hellenic Bank Association in Greece (2013-2015), Deputy Chairman of the British Hellenic Chamber of Commerce in Greece (1993-1997), Distinguished Fellow of the Global Federation of Competitiveness Councils (GFCC) in Washington USA (since 2016). He graduated with a BSc of Economics from the University of Athens (1981) and holds an MBA in Finance from Aston University in Birmingham, UK (1982).